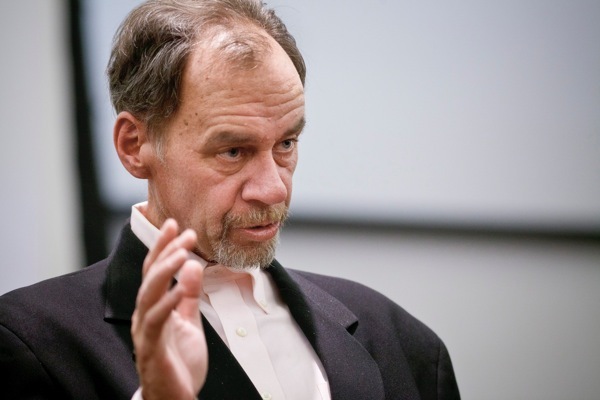 So saddened to hear about the sudden death of David Carr. I was fortunate enough to interview him at the Web Summit in 2013, and he was terrific company, and just as hilariously irascible as you would imagine. His legacy, not just as a media critic but as a chronicler of our times, will be immense. The past few months has been a febrile time in the US media world, with Amazon founder Jeff Bezos buying the Washington Post for $250 million and Ebay founder Pierre Omidyar vowing to put the same amount of money into a new digital-only media venture. Such a level of activity has meant the inimitable David Carr, media correspondent of The New York Times, has had an exceptionally busy time reporting on, and making sense of, all these developments. How the Washington Post changes under its new steward is an interesting question that everyone in the media business is asking. The fact that two distinctly different news projects funded by internet billionaires will be developing in parallel presents media watchers with a perfect experiment in determining how the media business is being changed. “Bezos has a willingness and energy to re-ask fundamental questions and perhaps answer them in a new way,” says Carr. “It’s nice to see them side by side – it begs the question are the things a legacy brand brings in terms of reputation, a great talent pool, an embedded audience, worth everything else that legacy brings to the table, which is legacy costs, habits of doing things that are probably not the best. In a sense, you’ve got one laid down next to the other, and it will be great to watch them develop. Carr was in Dublin to attend the Web Summit, where he interviewed Shane Smith, the founder of Vice, the alternative magazine that has grown into a billion-dollar media behemoth. Carr and Smith famously clashed before, as caught in a scene in the film Page One, a documentary about The New York Times. Anyone hoping for a fiery rematch, however, was disappointed – “I’ve known Shane a long time and I’m very fond of him,” says Carr. The strong relationship between the two figures, both iconoclasts despite their different media backgrounds, was in ample evidence. The rise of media empires such as Vice, Buzzfeed and the Huffington Post, however, hints at the changing nature of media consumption patterns, and how the internet is affecting audience appetites. How can the established media brands thrive in this environment? That said, despite the dramatically changing landscape, those established media brands are still held in high regard, says Carr – they are still the prestige names in the industry.